For a place dubbed “The City that Care Forgot,” New Orleans certainly seems to have a lot of care within it. My visit showed me that this is a city built on passion and soul (wrapped in Big Easy attitude, of course) featuring some of the richest culture within the States. The characters that colour New Orleans come in all size and shade and each one of them wraps you tighter into the city’s enchantment. I am with all my heart grateful that the US still has New Orleans and I can only hope that as a country, we put forth our best efforts to ensure it remains for the future. We stayed at the India House, which was my virgin experience in a US hostel. For $20 a night, we were put up in an ensuite room with a hotel-quality bathroom. It was quirky, clean, and had a surprising amount of amenities, with a cooked breakfast served every morning and a pre-set dinner offered all week, any time of the day or night. The India House is located in Mid-City, a more ‘real’ and gritty section of the New Orleans and a 10-minute streetcar ride from the French Quarter. The neighborhood itself felt perfectly safe and I actually savoured being a bit removed from the Quarter as we got to step outside the tourist bubble and experience being a racial minority, which was a new experience for me, especially within the States. If you are down with the hostel vibe and want to save money while in New Orleans, this is the place to do it. Ah, Bourbon St. If I could anthropomorphize Bourbon St. for a moment, it would be a frat boy who had just vomited all over himself. Really, just walk down it once to see it. Then don’t bother for the rest of your time there. It boggles the mind how people can be in one of the world’s epicenters of good music and then cram themselves into a sleazy, neon bar pulsing out shoddy, generic club mixes. But each to their own, I suppose. Their own terrible, terrible taste. Speaking of taste, I must touch on the more delectable variety. 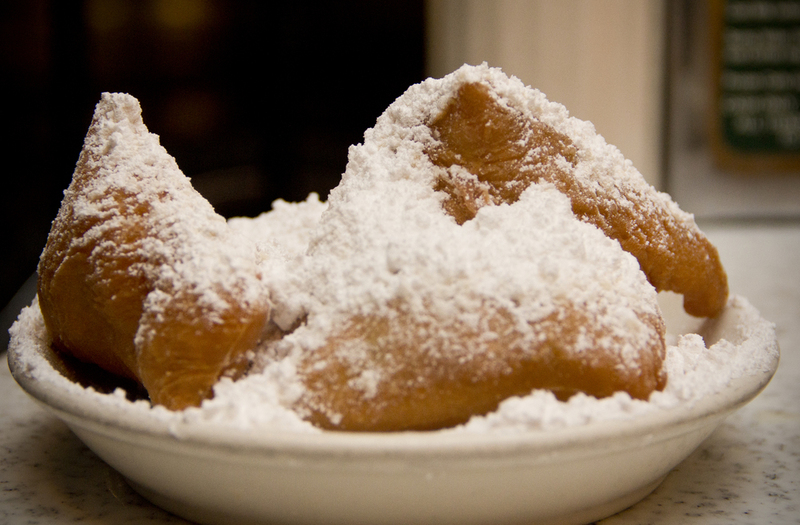 I’m generally not much a foodie, but it’s hard not to become a bit food-crazed and have several ‘EAT ALL THE THINGS’ moments while in the Big Easy. My favourite spot that we ate at was Three Muses, a fantastic venue on Frenchmen St that had amazing food, good drinks, excellent ambience, and of course, phenomenal music. And otherwise, as alligator is my all-time favourite meat, I was ecstatic to be a place that served it in every other restaurant. Is there anything better than deep-fried swamp reptile? Hardly. Of course, it is impossible to pass up beignets at Café du Monde, if only for the homeless guys who serenade patrons and drum up sing-alongs from passing inebriates fresh from Bourbon St. My only moment of shame was when I started eating pure powdered sugar by the spoonful, which I then spilled all over my pants in the signature Café du Monde ‘I-swear-that-white-powder-all-over-me-is-sugar’ move. I deserved it. Not being a huge fan of tours myself, I didn’t have any planned for the trip, but when my travel companion, Asia, mentioned that she wanted to see an alligator while we were here, I started doing some research about the best ways to get out to the bayou. Without a car, really the only option was to join a tour and after looking around a bit, a company called Cajun Encountersseemed to have the best reviews. Plus, they offered pick up from the doorstep of our hostel. The hour drive out to the swamps was a fascinating one, as we cleared the urban center of the city and were able to see the more rural neighborhoods that had been heavily affected by Katrina. Driving past the deserted skeletons of Wal-Marts and empty parking lots, it was sobering to see the damage the people of New Orleans are still recovering from. There was evidence of this out in the swamp too, once we arrived and got out in a small flat-bottomed boat. The banks of the Pearl River we were floating on were scarred in some spots by the old ruins of house boats that had once been tethered there, all of which were wiped out by the hurricane. The river itself had new inlets and offshoots that Katrina plowed through the land. But a few houses still stood on their iconic stilts, while their inhabitants fished out in the bayou. Being out in the swamp itself was really something unique. I love seeing different ecosystems and despite the fact that it ending up pouring on us while we were out there, I think that only added to the environment’s mystique. 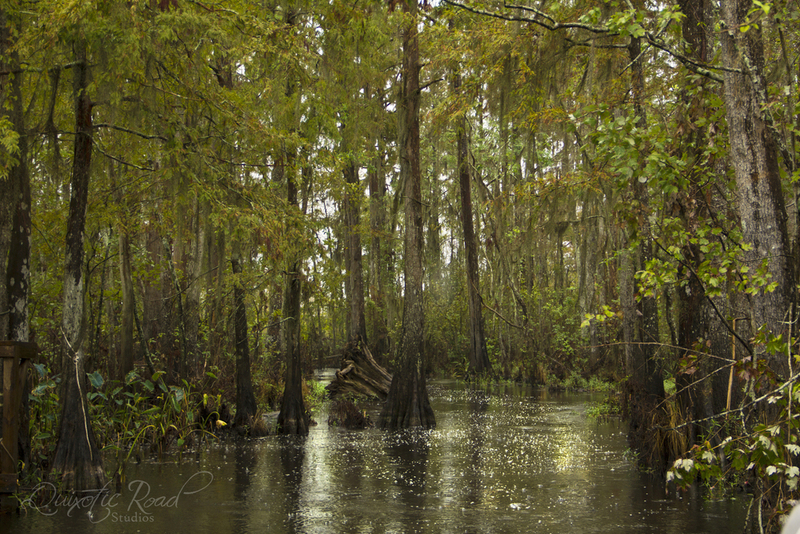 Sitting silently still out in the bayou in the middle of the rain, with dripping Spanish moss and white egrets passing silently through the trees, I felt the eerie magic of the swamp settle over me. Oh, and we definitely saw alligators. ~ “It’s Nawlins, not New Or-leens, or else ya gonna get robbed.” The best line of the trip, from a local schooling a group of tourists. The first step to not standing out as an outsider is to pronounce the city’s name right. Don’t forget your oozing drawl. ~ Break your cash so that you have plenty of ones. Tipping culture is very prevalent here and from drivers to musicians, a couple bucks are appreciated and expected. Especially with the bands…many of the best venues have no cover (not to mention the talent on the streets), so the musicians play solely for tips and at the quality they’re playing, they deserve your money. Also, the streetcars only take exact change ($1.25 one way). ~ Looking for good music? It’s hard not to trip over it at every corner in New Orleans, but if you want the best, immediately head down to Frenchmen St, on the outskirts of the French Quarter (just follow Decatur past the French Market). This is where you’ll find the most colourful (and cheapest) venues, the richest music, and all the locals. ~ Get out of the French Quarter. Sure this is the most iconic part of the city, with the most to see, eat, and drink, but there is more to New Orleans than this 78 square-block area. A short streetcar ride away, the Garden District reflects a fascinating history of the city’s upper crust (not to mention the beautiful Lafayette Cemetery) and lends itself to a serene Southern atmosphere. The swamps are also fascinating and I think it’s important to see the parts of the city that aren’t adult versions of Disneyland and have survived through the ordeals of nature. ~Always make sure your travel bag is big enough to fit both personal items, camera equipment and a pair of good dance shoes. You never know when you’ll meet a former Louisiana House of Representatives member in a Frenchmen St. bar who will challenge you to a zydeco dance-off. Forget the first-aid kit. It can’t compare to pulling out a pair of rubber soles from the depths of your purse and showing everyone that it is on.